Summer has arrived, but how can you sharpen your skills from the sun lounger? If you’re in southern Europe you’re no doubt already enjoying the sunshine; if you’re in France you might be planning your escape from hordes of football fans; if you’re in Sweden you’ve no doubt been enjoying Midsummer and if you’re in the UK and are like me…well…you probably have your golf bag in the car and are waiting for it to stop raining. Wherever you are, summer is here! I also fondly remember the optimism from those days back at school when the end of term arrived and you faced the whole summer stretching ahead of you, full of excitement about all the free time and all the things you wanted to do. Okay, maybe that luxury is a thing of the past for us now but the point is that with the summer holiday season ahead of us, it gives us time to take a break, refresh and consider what we want to achieve in the second half of the year. That’s why we’ve chosen July and August to run our first EMEA Qlik Summer School. It’s a series of webinars aimed to help you refresh and develop your analytics skills – whatever your level. Perhaps you’ve been meaning to learn more about that free trial you downloaded? Or maybe you want to go from Qlik Sense novice to Qlik Sense ninja? Perhaps you’ve been using Qlik for years and want to know what’s new? Or maybe you’ve got three weeks off work to spend with the family and you’re wondering how you’re ever going to get any peace and quiet? I joke, of course, about that final one, but whatever your reason you should come and join us! pick up vital tips and techniques to make you more productive, help troubleshoot your applications and even enlighten you to capabilities you didn't know existed. Are you #Qlik fit for the summer? We've got just the workout program for you! There will be sessions on everything from how best to get started with analytics, through to deep dives into creating widgets and using external data in your self-service systems. I’ll be delivering some of the sessions and I’ve roped in a number of willing colleagues too, including experts such as Henric Cronström, Patrik Lundblad, Helen Davey, Ian Crosland and Josh Good. Sound like fun? 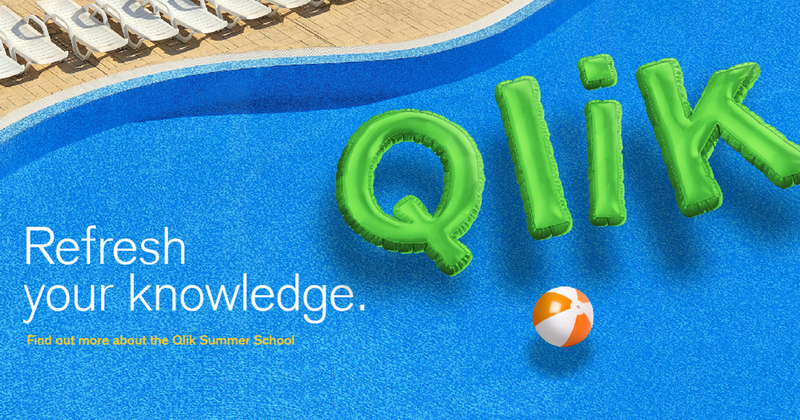 Sign up online here: http://go.qlik.com/Qlik_Summer_School.html.